To better understand rider needs, a system-wide onboard survey will be conducted the weeks of October 29 and November 5. Metro updates this survey every five years. We ask your participation in completing the short survey during every trip you make on those days. Answering all the questions is very important for us to better understand more about our passengers. Please be assured your responses will be fully anonymous and cannot be linked back to you. 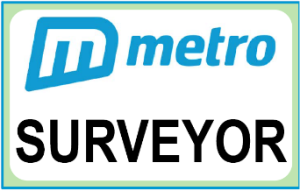 The surveyors will easily identifiable wearing their SURVEYOR badge with the Metro logo. Please note, not every surveyor on board is collecting survey responses from passengers. We also have surveyors who are there to count how many people are getting on and off the bus to track travel patterns across the bus network. Your responses will provide details into how and why people ride, help Metro understand customer demographics and travel patterns, and general feeling on the service provided. The information will also be used by Metro in our FTA required Title VI reporting. You can enter to win one of four $25 gift cards or one of five 30-day passes when you complete your survey!